The restaurant is tucked away down the side of the Hilton. Pimlico barely resembles how it looked six years ago, when we worked here. Luxury flats dominate the skyline — one of them sits where our former office lay. In amongst them all is the Hilton Doubletree, and attached to the side of it is Art Street Kitchen. 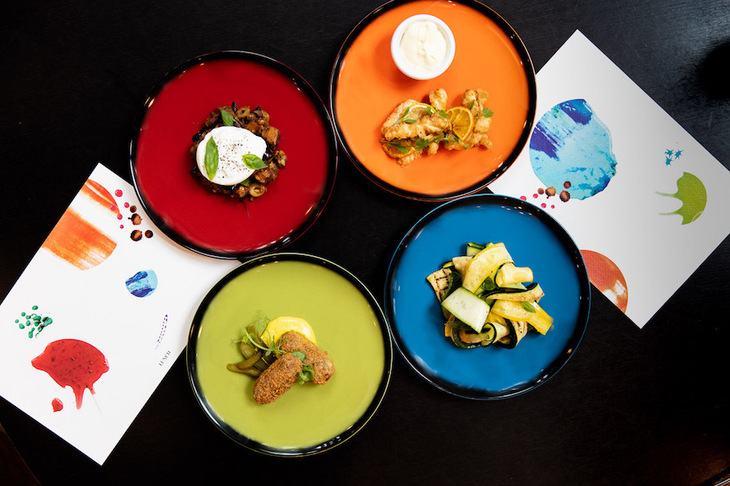 Not far from Tate Britain, we applaud the idea of giving the restaurant an art-y feel with splotches on the menu and brightly coloured plates. It's a shame the theme hasn't been taken further, the decor could be far brighter — but alas the table and walls aren't game. The relaxed menu is split into small and large plates so for those who — like Joey from friends — don't share food, they can keep to themselves. If you're more relaxed and enjoy a tapas vibe, then order lots of dishes and tuck in together. We're big fans of the colourful plates. The dips with pitta arrive and while taste-wise they do the job, the dips have a store-bought feel and we doubt whether they were made on site. The sweet potato fries with cayenne pepper sounded perfect for spice fiends, but no heat was detected — a real disappointment. Similarly the calamari could have used a kick, something to stop it tasting so bland. 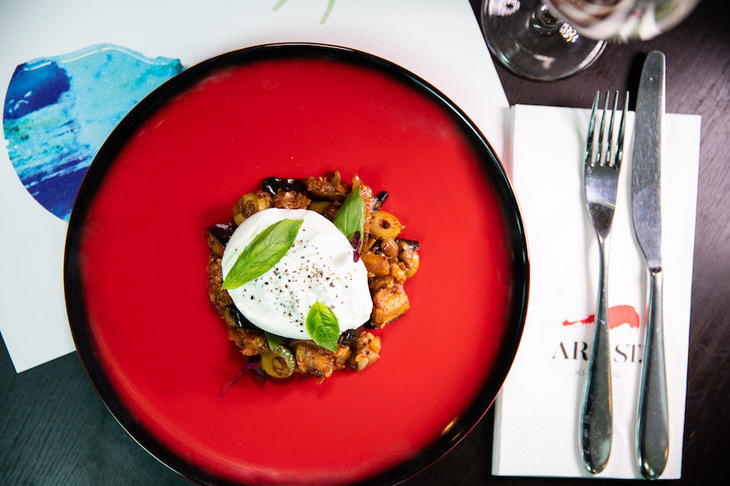 The burrata with aubergine was the one small plate that stood tall, just because it had some noticeable flavour to it. On to the larger plates and things start to improve. The lamb kofte was tender, even if the pitta alongside it didn't appear fresh. The saviour in this meal was the pumpkin gnocchi. We're huge gnocchi fans and strongly feel it's a dish missing from far too many London restaurants — including Italian ones. Even when they do it's always tiny portions. Here it's massive, and big cuts of pecorino draped over help to bring the flavour. The burrata is the strongest of the small plates. Dessert is another treat with the cinnamon ice cream the perfect flavour to complement the apple tarte tatin. It's a quality end to a meal that finishes stronger than it started out. The fact this restaurant is attached to a hotel and that this area has a dearth of places to eat, is likely to guarantee custom. However, if it wants to draw new visitors from further afield, improvement is needed. 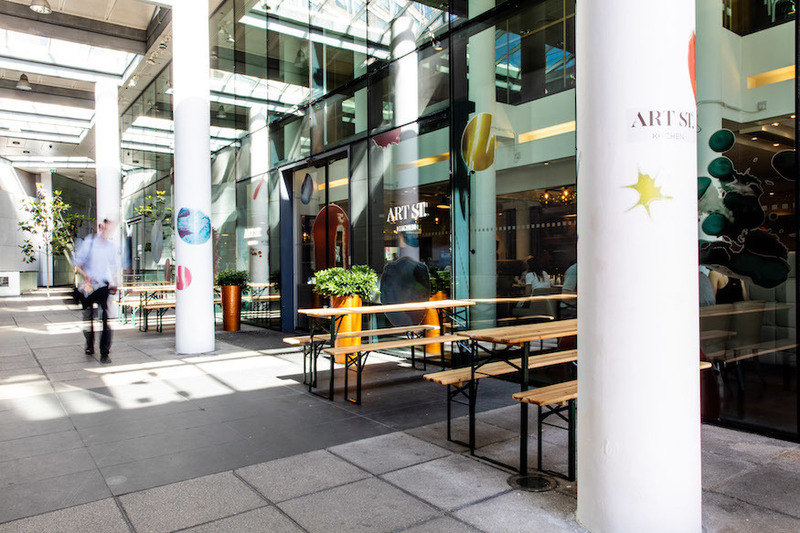 Art Street Kitchen, Art Street, Westminster. SW1P 4DD. The meal in the menu would cost £60 for two, excluding drinks.